While I was at the 2010 LA Auto Show, I had a chance to sit down with Dodge CEO Ralph Gilles where he talked about the new and revised 2011 Dodge models, along with briefly discussing the upcoming Caravan R/T that he playfully referred to as “The Man Van” and according to The Automotive News, that masculine minivan will make its debut at the 2011 Chicago Auto Show. Dodge has not made any official mention of the new Grand Caravan R/T making its debut tomorrow in Chicago but we do know that Dodge is planning a debut that will be broadcast on the internet for all to see. The press release announcing that the world would be able to watch this debut online offered no idea as to what vehicle(s) will debut but based on my discussion with Ralph Gilles in LA, The Automotive News suggestion that it could be “The Man Van” seems very likely. Gilles openly discussed the upcoming Grand Caravan R/T, explaining that minivan sales demographics do not fit into the stereotype that these people-movers are just for “soccer moms”, as the majority of new minivan buyers are not female and in many cases, they do not have children. To help shed the reputation of the minivan being a feminine vehicle, the Grand Caravan R/T will come with a variety of styling changes to make it more masculine – especially on the inside. Gilles talked about an entirely-black interior treatment with front and rear captains seats, state of the art sound and entertainment systems and cargo features that will make the Grand Caravan R/T more “acceptable” for something like a camping trip or a tailgating party. 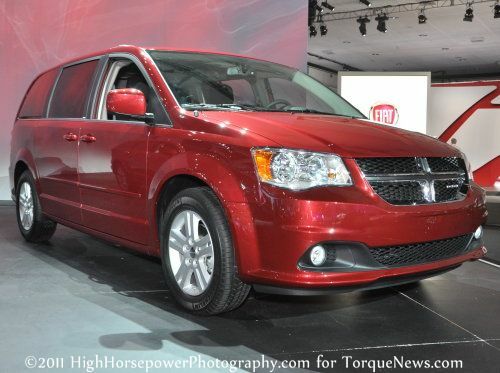 Again, these indications of what to expect from the Dodge Grand Caravan R/T are fairly vague but should the production version debuting tomorrow follow the hints from CEO Ralph Gilles, we can expect the Caravan R/T to be a sport model with an emphasis on sport and a heavy dose of high tech interior goodies. TorqueNews.com will be on site for the 2011 Chicago Auto Show bringing you all of the biggest automotive news from the Windy City!